The year-round release schedule has gotten to the point that it brings us a legitimate franchise film in January, but it's still a date that's not without its stigma – with the question of just how tired this franchise must be to resort to this strategy. 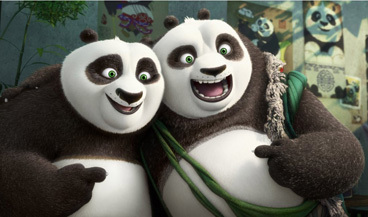 Kung Fu Panda 3 is... the third film to feature a panda that also does Kung Fu – it's not a particularly complicated franchise – featuring Jack Black again as the title character, once again protecting China from a supernatural threat. As hinted at in the end of the second film, this sequel reunites our hero with his long lost panda brethren, including his father (Bryan Cranston) as their habitat comes under the threat of some sort of water buffalo type character (JK Simmons). Once the student, he has to now become the master and guide his family to safety by training them how to use kung fu themselves. Black's effervescent vocal performance and the earnest portrayal of what is essentially a fanboy reaching mastery has been the selling point of both of these films to date, though that element seems to be wearing thin. Indeed, there often seems to be a point with family franchises where after a few successes, audience reaction turns from “Okay, that was mildly entertaining” to “Screw you for trying to entertain me!” Witness the turn on Shrek by the fourth movie, which took a 40% hit in opening weekend despite following the same formula. Audiences grow out of these films, and it can be fairly clear when filmmakers are just going through the motions. Of note, it's been eight whole years since the first KFP movie, about the same length of time it took for Shrek to expire (then again, Ice Age is still ticking a full 16 years later, and that's the very textbook definition of mediocrity). Reviews are actually pretty decent for this film, although I expect it's being tossed a bone or two for not aspiring to all that much, and for not being irritating, simply just being pleasant and well-animated (it's long been one of the better-looking franchises). However, this release date shows little confidence from DreamWorks, and the ads really fail to inspire. I'd look for an opening weekend of about $34 million, a sizable fall-off from previous entries. Disaster drama The Finest Hours, or: Bad New England Accent: The Movie, details a rescue of a pair of oil tankers split in half during a storm off the coast of Cape Cod in the 1950s, and basically hits all the notes of The Perfect Storm without the star power or wow factor of that film. Chris Pine, Casey Affleck, Ben Foster and Eric Bana are the notables (nahtables?) in this, but we seem to, as a culture, be well past this whole “CGI disaster movie” phase, as the underwhelming performance of Into the Storm showed. Or at least we're tired of them without a little certain pizzazz, and The Finest Hours seems to just be a soggy and dour drama that eventually gives us a couple of big waves. Seeing C-listers bicker for a while until they're eventually rescued doesn't make for particularly gripping cinema, and we need a lot more than “but there's a really big wave!” Fooled before, thanks very much. I'd look for about $10 million this weekend.